Posted on Saturday, December 28th, 2013 at 5:38 pm. 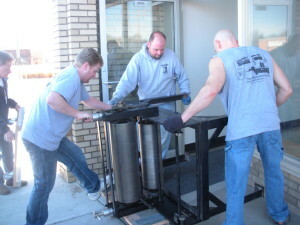 The big move of two presses into Constellation Studios, needing the muscle of some great moving guys! Also drawers of type and some cabinets. Now it feels like the studio is shaping up, yet more is to come. This will be a step by step process, but exciting to have the new home for my 35 year old Brand Press.